The southeastern flank of Mount Etna—one of Europe’s highest active volcanoes, located on the Italian island of Sicily—is sliding into the Mediterranean Sea at the rate of a few centimeters every year. Understanding this process is important as it could precipitate a catastrophic collapse of the volcano in the future, experts say. The resulting landslide could, in turn, produce a tsunami that threatens human life in the region. Now, an international team of researchers—led by Morelia Urlaub from the GEOMAR Helmholtz Centre for Ocean Research Kiel, in Germany—has proposed a new driver for this sliding activity, while suggesting that the volcano’s flank movement poses a greater hazard than previously thought. In a paper published in the journal Science Advances, the scientists report that the flank is sliding primarily due to gravitational instability. Previously, it was assumed that the pushing of ascending magma—or molten rock—inside the volcano was responsible for the movement. Until now, it has not been possible to determine which of these processes could be causing the sliding. In what was the first such offshore movement monitoring study, the team set up and analyzed a network of five underwater transponders. They were equipped with pressure sensors to continuously monitor the displacement of the seafloor around Etna’s submerged southern boundary on Sicily’s east coast. "Mount Etna is one of the best-investigated volcanoes in the world, and almost every kind of monitoring data is available," Urlaub told Newsweek. "However, this is only valid for the onshore—but the volcano continues underwater. 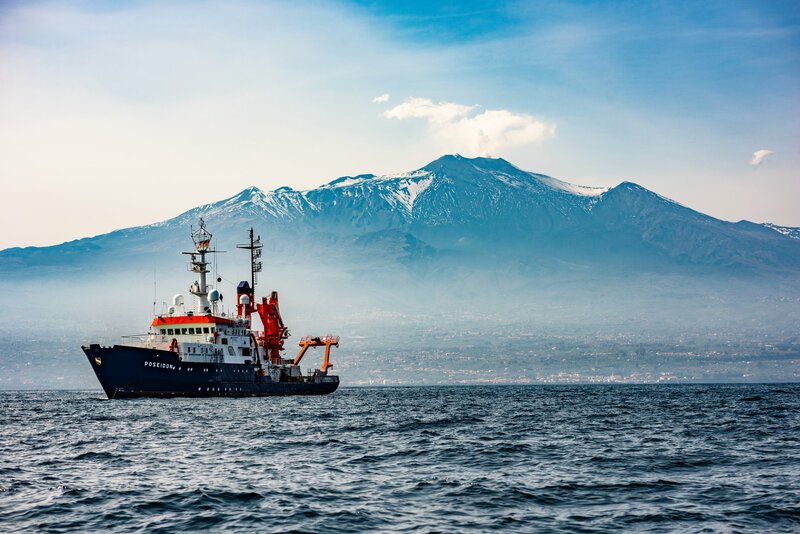 Despite this wealth of data available for Etna, there is a huge scientific discourse about why Etna's southeastern flank is sliding seawards and this is mainly because very little is known from the offshore." "So we decided to shed some light on the offshore processes—and at the same time the new technology that we applied here became available," she said. The observations made with the transponders between April 2016 and July 2017 showed that Etna’s deformation increased away from its magma system, suggesting that the bulk of the sliding is being driven by gravity, according to the authors. "The submarine part of the volcano is moving at a similar rate as the onshore flank," Urlaub said. "This means that, when we want to understand the dynamics of a volcano, we really have to include the offshore. We clearly showed this for Etna, but it might equally hold for many other volcanoes with their feet in water." The researchers say there is a possibility that the southeastern flank may collapse catastrophically as a result of the sliding motion, although making such a prediction is beyond the current capabilities of scientists. "For sure, we cannot exclude this hypothesis, but we cannot say if and when a collapse can occur," Alessandro Bonforte, an author of the study from the Italian National Institute of Geophysics and Volcanology, told Newsweek. The study also shows that a much larger area than previously thought is affected by flank sliding: "This movement is not caused by uprising magma that pushes the flank sidewards as previously thought, but by gravity pulling the entire flank downslope," Urlaub said. "This means that the hazard potential of a catastrophic collapse is higher than previously thought." "On land, this motion has been tracked since the 80s but three decades is almost nothing compared to the geologic 'life cycle'—considering that Etna is around 500,000 years old." John Murray—a volcanologist from the Open University in the U.K. who has studied Etna’s sliding activity before but was not involved in the latest research—told Newsweek that the latest results are intriguing. “This study is particularly interesting to me in that it extends the measurement of Etna’s southeastward sliding a further 12 kilometers [7.5 miles] from the summit, for the first time making measurements of Etna’s flank movement below sea level, at a depth of around 4,000 feet,” he said. According to Murray, many previous researchers had supposed that Etna’s sliding was initiated by magmatic pressure from the active summit, but he says this study contradicts that idea. “The movement described is instead caused by simple downslope sliding of the submarine flanks under gravity, this movement then pulling on the upper slopes of the volcano, rather than the other way round,” he said. The geological record, comprising millions of years, shows that volcanoes can collapse catastrophically from this process. There are numerous examples of this, the largest ones being in Hawaii and the Canary Islands. "Such events involve a large sector of the volcano detaching itself in one massive, devastating landslide, and occur worldwide about four times per century," Murray said. "The authors of this study draw attention to this, but at present our knowledge of the precursors to such disastrous events is very rudimentary, making meaningful predictions impossible." This article has been updated to include additional comments from Morelia Urlaub and Alessandro Bonforte.